Heisman Favorite: Cam Akers, RB, Florida State. According to Vegas, running backs Cam Akers and AJ Dillon have the best odds of winning the Heisman from the ACC. Clemson QB Kelly Bryant is close behind but I’m not sure he holds onto his starting job so I wouldn’t be putting money on him now. 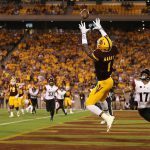 Akers has 2,000 yard potential while Dillon has 20 TD potential; ultimately I lean towards Akers as he will be playing on a better team than Dillon and should get more national exposure. Darkhorse Heisman Candidate: Daniel Jones, QB, Duke. As I have previously discussed in this space, picking a conference’s best dual-threat quarterback is your best bet for predicting the Heisman winner. I’m a fan of Jones, see below, and think he has 3,000/750 yard upside but he needs to score more. Last year he had just 18 total TDs and would need to double that to get in the Heisman conversation. I’m not saying it’s likely, or even probable, but it’s possible. Offensive Player of the Year: Taquon Marshall, QB, Georgia Tech. Few players in the FBS will be as valuable to their unit as Marshall to the Georgia Tech offense. He won’t get the national recognition of somebody like Cam Akers but he’ll put up big numbers and be a CFF darling. If he stays healthy, Marshall will top 1,000 yards each passing and rushing and will total 30+ TDs. Defensive Player of the Year: Dexter Lawrence, DL, Clemson. Take your pick from the Clemson defensive line. I’ll go with Lawrence because of the impact he has on the opposing line on every play. Lawrence had a huge freshman season with 62 tackles and 6.5 sacks but regressed in 2017 to 33-2.0. At 6040/340, he’s a mountain of a man. It’s rare to find an interior defensive lineman with the combination of size and athleticism that Lawrence shows. Newcomer of the Year: Trevor Lawrence, QB, Clemson. According to 247Sports, Trevor Lawrence was the top rated recruit in the 2018 class and had a near-perfect grade of 0.9999, the highest I have seen on their site. Lawrence is huge, listed at 6060, and put up equally big numbers in high school. His recruiting profile on 247Sports touts a 160:21 ratio with over 13,000 passing yards. I take high school stats with a grain of salt of course, but that’s just insane. I am not a big Kelly Bryant fan so I think it’s only a matter of time before we see Lawrence take over at Clemson. Cam Akers, RB, Florida State: Akers will be the best of a talented group of young backs in the ACC this season. Travis Etienne, RB, Clemson: Etienne is an explosive runner with a long stride. He gained 766 yards and scored 13 TDs in a RBBC role last season and finished with a 7.2 yards per carry average. It remains to be seen if he can be as effective with a larger workload. AJ Dillon, RB, Boston College: Dillon is a 6000/245 bruiser who has a nose for the end zone. He scored 14 TDs last season and should see 20 this season. He’s a workhorse back who earned 300 carries as a true freshman and had four games with over 30. Greg Dortch, WR, Wake Forest: Dortch is an undersized (5090/165) slot and screen receiver who dominated at times in 2017 before getting injured. Against Louisville he had an incredible 10-167-4 line before falling to an abdominal injury. He contributes as a rusher and returner as well. 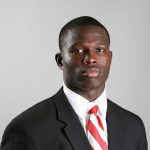 Best QB-WR Tandem: Ryan Finley and Kelvin Harmon, NC State. 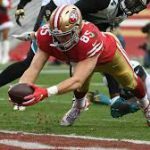 Finley is quietly the conference’s best quarterback prospect; meanwhile Harmon should be a first round fantasy rookie pick in 2019. I doubt many casual fans know their names though because they shared the spotlight last season with draftees DE Bradley Chubb, TE Jaylen Samuels and RB Nyheim Hines. Finley and Harmon eclipsed 3,500 and 1,000 yards respectively so they are a productive duo. I have more on these two Wolfpack stars below. 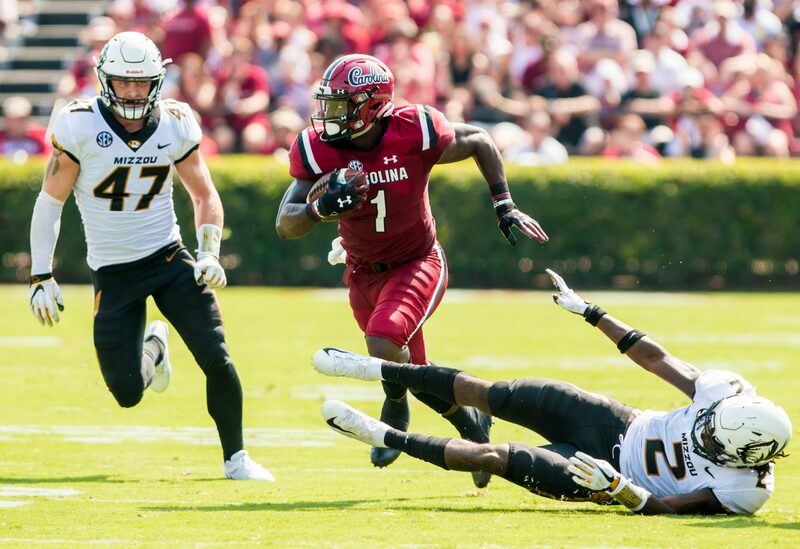 Best RB Corps: Georgia Tech. It should come as no surprise that a triple option team like Tech would land in my “Best RB Corps” spot. The Yellow Jackets led the conference in rushing (307 yards per game) and return their six leading rushers from that squad. The two that catalyze the option attack are QB TaQuon Marshall (1,146-17 rushing and 927-10 passing) and RB KirVonte Benson (1,073-6). Coach on the Hottest Seat: Larry Fedora, North Carolina. Fedora has been in the news recently after his curious remarks at ACC Media Day. Those comments were best summarized by Luke Decock in the Charlotte News-Observer: “This is all ludicrous, of course, the earnest hyperbole a little less dangerous than the willful denial.” Even if Fedora didn’t put a target on his own back, he went 3-9 in 2017 and hasn’t won a bowl game since 2013. The Tar Heels are also dealing with “another compliance black eye” after numerous players were suspended for selling team-issued apparel. A winning coach could withstand most of this drama but not one who suffers another losing season. I was consistently down on Miami last season. I did not believe they could run the table and kept picking against them during their winning streak. The wheels finally came off in late November when Miami lost to Pitt, a game I still remember for how frustrating it was to watch, which started a season-ending three game losing skid. Miami should be in the ACC Coastal running again but what makes them even more interesting to watch are the plethora of NFL prospects they will field. On offense they will feature RB Travis Homer, WR Ahmmon Richards and TE Michael Irvin Jr (Editor’s note: Irvin Jr. is now injured). The defense returns its top five tacklers, including first round hopeful safety Jaquan Johnson. LB Shaq Quarterman and CB Michael Jackson should end with high draft grades as well. The Hurricanes feature 14 returning starters, including QB Malik Rosier. I was very critical of Rosier last season and hope that an additional season of experience helps him play more efficiently. If he does, Miami will end up in another New Year’s Six bowl, as I am currently predicting, with a shot at the playoff. I don’t think there is any disagreement among college football fans that the Seminoles will rebound from a demoralizing 7-6 season last year which required them to make up a meaningless game against UL-Monroe just to become bowl eligible. The question is, just how high do they rebound with new head coach Willie Taggart? I have gone out on a slimsy (yes, that’s a word) limb and predicted that they will be selected for the College Football Playoff. Three of FSU’s toughest games (the nationally broadcast opener versus VaTech, Clemson and Florida) will be played in Tallahassee. I’m also feeling optimistic because I think the offense will be miles ahead of 2017. QB Deondre Francois returns from injury; if he’s shelved again, sophomore James Blackman now has valuable experience. The offensive line, which tends to be a weak spot for Florida State, returns four starters. The largest factor will be the running backs: wunderkind soph Cam Akers and senior Jacques Patrick. Akers crested 1,000 yards (1,094) and earned 2nd-Team All-ACC honors as a true freshman. Patrick is a 6030/231 bruiser who added 780 yards of his own. Both backs had seven scores. The receiving corps is filled with young and/or unproven targets but the team’s leading receiver, Nyqwan Murray returns. The defense may struggle as they only return four starters and lost top prospect Derwin James. One interesting stat gives me hope: per Phil Steele, the last time the Seminoles returned just four defensive starters, which was 2013, they allowed just 12.1 yards per game. Oh, and by the way, that team went 14-0 and won the BCS National Championship. Daniel Jones, QB, Duke: Jones is on my shortlist of candidates for the 2019 QB1 spot. In my limited study, I noted that he has good anticipation and throws excellently while on the run. He has above average athleticism for the position and runs with good vision. There are some areas for improvement, namely his passing accuracy and pocket awareness. Plus, he could add a few pounds to fill out his 6050 body due to his physical playing style. His touchdown total decreased last season (16 to 14) while his interceptions increased (9 to 11), which is not a good sign. He did add 518-7 on the ground which helped keep the Blue Devil offense moving. I’ll check in on Jones periodically this season. If he improves nearer a 2:1 ratio he’ll be in consideration for a first round NFL Draft pick. Deondre Francois, QB, Florida State: This time last year, I was one of many college football fans who was expecting Francois to take a big step forward in 2017. Unfortunately, that growth was stunted in the Seminoles’ opener against Alabama after he sustained a season-ending knee injury. 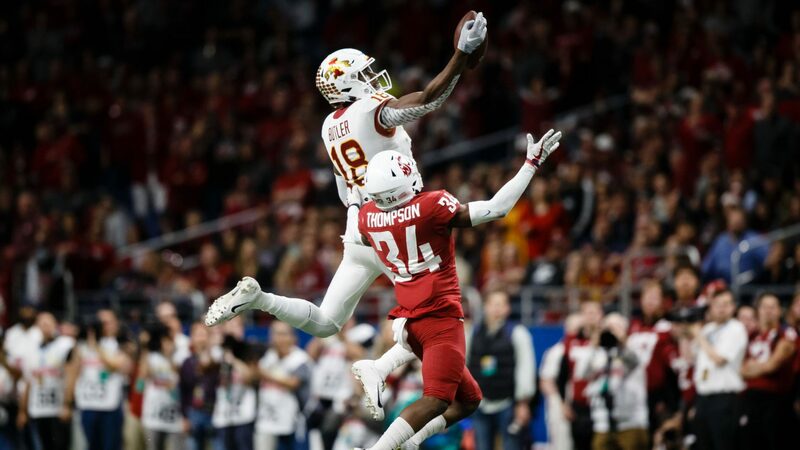 True freshman James Blackman filled in and, luckily for Francois, did not do enough to guarantee himself the job for 2018. I think Francois has the inside track to win the starting job but it’s not impossible to think that Blackman wins the gig in Fall camp. Francois is tough as nails but is on the smaller side for a quarterback prospect (6010/205). He has 3,500 yard upside so I am pulling for him and I hope he gets a chance to realize his potential. I am predicting that FSU will make a run to the College Football Playoff and that hope rests squarely on Francois’ shoulders. Eric Dungey, QB, Syracuse: I loved watching Dungey last season and recall his standout games against Pitt and Clemson. Sadly, Dungey has a long injury history which has limited him to just 26 career games over three seasons. He’s not all that prolific or efficient (40:21 career ratio and 131.5 career passer rating) but there’s something about him that I enjoy watching. He is a true dual-threat quarterback: in a shortened season he still managed 595 rushing yards and 9 TDs. I’m not sure there exists a universe where Dungey is a relevant 2019 rookie but he’ll be fun to watch in 2018 as long as he stays healthy. Travis Homer, RB, Miami: Homer started the season as the backup to Mark Walton but took over after Walton went down with an injury. He had a six game stretch in the middle of the season where he totaled 642 yards and 4 TDs; he also added 12-146-1 as a receiver in that span. Homer did sputter a bit down the stretch but that middle-season burst is encouraging. 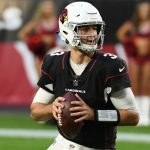 Per DLF, Homer is one of the youngest draft eligible players in the 2019 class which could increase his draft stock if he can enhance his numbers this season. 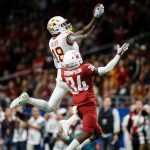 Jaylen Smith, WR, Louisville: Our friends at the Dynasty Command Center loved Smith for the 2018 draft before he decided to return to school. 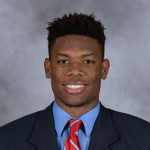 In Volume One of their rookie prospectus they listed Smith as the WR5. Despite coming back for his senior season, Smith is just 21 years old. He has elite size at 6040/219 and pairs his big frame with 4.50 speed. He is a constant deep threat. Eight of his 60 receptions in 2017 went for 25 or more yards; in 2016, on just 27 receptions, that number was even higher at nine. A wrist injury caused him to miss time in 2017 but he finished strong with 7-107-1 in the Cardinals’ bowl game. My biggest concern is whether new starting quarterback Jawon “Puma” Pass can hit Smith downfield with the same frequency. Tommy Sweeney, TE, Boston College: Sweeney is the leading returning receiver on a potentially ascending BC team. Last season, he paced the Eagles with 36 receptions, 512 yards and 4 TDs. The passing offense should improve in 2018 with QB Anthony Brown back under center. Brown started the year as a redshirt freshman but missed the end of the campaign with an injury; when he was healthy he struggled (11:9, 51.9%) but another year of experience will help. I have not watched any film of Sweeney but based on his size (6050/255) I expect that he will be able to hold his own as a blocker. Austin Bryant, Clelin Ferrell, Dexter Lawrence, Christian Wilkins, DL, Clemson: I don’t have the space, or honestly the expertise, to delve into the Clemson defensive line in this preview. Suffice it to say that they will be a fearsome group. Come next Spring, we could see all four of these guys getting first round NFL Draft buzz. If you don’t believe me, just check out one of many mock drafters who are predicting just that. Some others are saying that this unit is overrated – let’s ask ACC quarterbacks what they think. Jaquan Johnson, S, Miami: Johnson is the leading safety prospect according to a number of sources I trust (i.e. Phil Steele’s preview magazine and DraftScout.com). He’s a former 4-star recruit who decided to stay home and eschew offers from heavyweights like USC, LSU and Clemson. Johnson became a full-time starter in 2016 and did not disappoint. He finished with 96 tackles, 4 INTs, 3 forced fumbles and 2 fumble recoveries. The Miami offense prides itself in forcing turnovers and Johnson was an important link in that chain (pun intended). 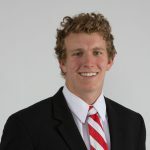 Finley is entering his third season as the starting signal caller for NC State. He transferred from Boise State in 2015 as a graduate transfer. Finley was granted a sixth year of eligibility because his two seasons at Boise were marred by injuries. So, he arrived at Raleigh as the rare graduate transfer with three years of eligibility for his new team. If you’re thinking that Finley must be an old prospect after such a winding road, you’d be right. Finley is currently 23.6 years old and is the oldest prospect on DLF’s 2019 age table. Age doesn’t necessarily make or break somebody’s draft stock, but it will be a hurdle Finley needs to overcome in scouts’ eyes. On the field, Finley has played well but has been more of a distributor than a dynamic playmaker. He has completed 63.0% of his passes for NC State with a 35:14 ratio over two seasons. He doesn’t commit many turnovers but he also doesn’t sling the ball around either. He threw for a career-high 3,514 yards in 2017 but his yards per attempt dropped to 7.4 (sixth best in the ACC). Finley added a bit on the ground in 2017: 198 yards and 3 TDs. He’s not the type of prospect whose stats and game logs will garner attention from casual fans. Instead, Finley will need to impress during film study. I came away from my viewing of Finley feeling conflicted. His best trait for me was his awareness, specifically his penchant for fakes of all kinds. There’s a nuance to his play action and pump fakes that I don’t often notice in other college passers. He also has a good awareness of the field and situation. When he scrambles he rarely takes a hit and instead is able to take a track that gets him out of bounds before contact. This combination of field and situational awareness was perhaps best illustrated by a play against FSU. 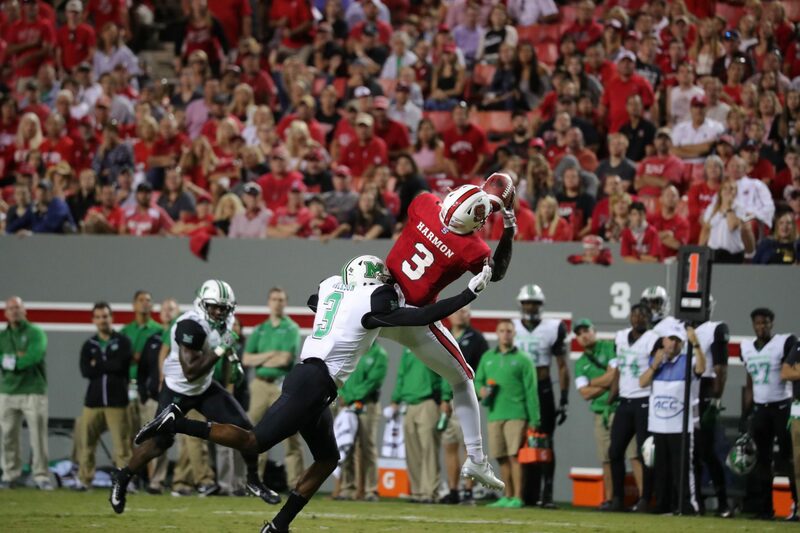 The Wolfpack were up eleven late in the game but Finley was in shotgun in his own end zone. There was a bad snap and as Finley scrambled for the ball, he swatted it out of the back of the end zone for an intentional safety rather than allowing a defender to fall on it for a game-changing touchdown. Probably my fave play from studying Finley. Late in game, up 11, swats ball out of EZ for safety rather than potentially giving up a defensive TD. Another example of his positive awareness. Harmon emerged as a sophomore in 2017, finishing with 69 receptions, 1,017 yards and 4 TDs. His season started off with a bang when he had a combined 19-235-1 line to start the year against South Carolina and Marshall. He also had big games against Notre Dame (7-97-1), Clemson (8-155-1) and Wake Forest (8-105). He has boom or bust capability, shown by a few duds on the game logs: four games under 25 yards. Harmon exhibits a good mix of speed, size and strength. I estimate he has 4.50 speed and he’s listed at 6030/213. While I think Harmon may measure shorter than 6030, there’s no questioning his ability to win the ball in the air. 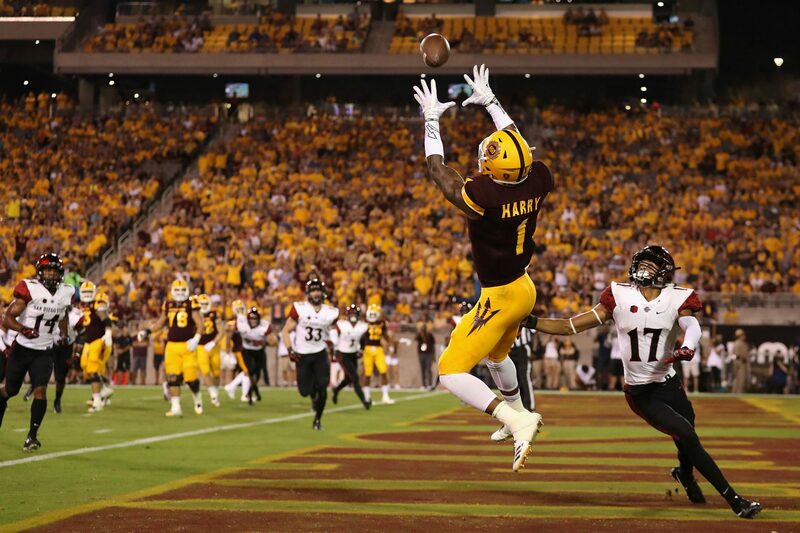 Put simply, Harmon excels in contested catch situations. He often high points the ball and is strong enough to survive the defender and the ground with possession. He’s also adept at catching the ball over his shoulder while in stride. He’s a powerful runner after the catch who can break tackles and carry defenders on his back for extra yardage. In the game against Clemson, I noted two spectacular routes that he ran which gave him separation. It’s a shame there aren’t more full games cuts of Harmon because I would love to see more of his route running because what I saw was great. He releases well off the line due to his combination of speed and strength. If I were to nitpick, I would say that Harmon needs to be eliminate some of his body catches. Sometimes it’s like he jumps too high which causes him to bring in the ball at his midsection rather than away from the body with his hands. Ahmmon Richards starred as a true freshman in 2016. He earned freshman All-American honors after finishing the year with 49 receptions, 934 yards and 3 TDs. His 19.1 yards per reception mark was fourth best in the ACC that season. Expectations were high for Richards in 2017 as a sophomore but unfortunately injury sidelined him to start the season and again in October and then again in December. Richards ended up playing just 7 games, totaling 24 catches for 439 yards and 3 TDs. Encouragingly, he finished the regular season strong, combining for 7-98-2 against Virginia and Pitt. Richards is a lean 6010/190. At that size, I’d like to see him flash 4.45 speed which looks probable on film. Per the Hurricanes, he’s ran a 4.31 and a 4.40 on previous attempts but you always need to question school-reported numbers. Note: the rankings referenced below refer to the Week 14 AP poll. CFP rankings were not yet available at the time of writing. Heisman Update: Baker Mayfield finished off his regular season with a 281 yard, 3 TD outing. The Heisman winner is Mayfield. Moving on to more important topics. Playoff Picture: Last week, I postulated that Alabama and Miami would be in danger of missing the playoff even if they lost and finished with one loss. I was not expecting them to both lose! Having them both lose keeps a potential playoff spot open for the other if championship results fall properly. 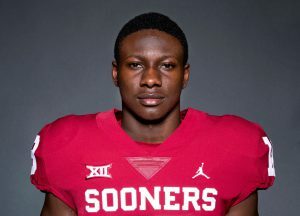 As of this writing on Sunday evening, I anticipate the Top 7 to be: Clemson, Oklahoma, Wisconsin, Auburn, Georgia, Miami and Alabama. The order of Georgia, Miami and Alabama is tough but I put Alabama last because while their loss was “better” than Miami’s, they do not have as good of a win on their resume as Miami over #3 Notre Dame. Two of the four spots are easy: the winner of Auburn/Georgia is in, as is the winner of Clemson/Miami. If Oklahoma and Wisconsin win, they are obviously in too and the playoff is set. Things get very interesting though if one of them loses, specifically Oklahoma. If Oklahoma loses, there is no obvious replacement like if Wisconsin loses (a win against #3 Wisconsin might be enough to jump Ohio State to the #4 spot and squeak in, see below for an alternate possibility). I think that if Oklahoma and Clemson lose, we might see Clemson hang in with the #4 ranking (they would have five Top 25 wins, a 3-point loss when their quarterback was hurt and a loss to my projected #6 in Miami – that is still a better two loss resume than others). For now, I’m predicting chalk but am hoping for some chaos. Stanford win over USC in the PAC-12 Championship so that both finish behind UCF in the final rankings. Oklahoma win over TCU in the Big 12 Championship. TCU would move up in the rankings and stay ahead of UCF with a win over Oklahoma. Better for UCF to cede one of the playoff spots to Oklahoma and jump ahead of TCU. Georgia win over Auburn in the SEC Championship. Auburn would be totally out of contention with 3 losses; if Georgia loses they probably stay ahead of UCF with a strong two loss resume. I think we’d all take Auburn in a head-to-head matchup against UCF but it’ll be hard for the committee to put an undefeated UCF behind a three loss team. Clemson wins big over Miami in the ACC Championship. If Miami loses two straight, especially an embarrassing one to Clemson, they should fall out of the Top 10. Ohio State wins close over Wisconsin in the Big Ten Championship. If Wisconsin wins, they are in but the reverse is not guaranteed. In three iterations of the CFP, we have not yet had a two loss team make the cut. If Ohio State gets a close, unconvincing win against Wisconsin, is it possible that the committee leaves a two loss Ohio State out in favor of an undefeated UCF? Maybe the injury to JT Barrett factors into the decision if it lingers and the committee says that a weakened Ohio State is not worthy of the playoff. Florida State vs History: Florida State will be playing this week but not in the ACC Championship as they would have hoped a few months ago. Instead, the Seminoles will be battling 4-7 UL-Monroe (the game was cancelled earlier in the year due to Hurricane Irma). Florida State has a lot of history riding on this inconsequential game because they have not finished with less than six wins in a season since 1976 which was Bobby Bowden’s first season at the helm. What an incredible run of success for a team. I don’t know for sure but I assume that has to be a record for most consecutive seasons with a .500 record or better. It’s a little iffy to get that sixth win in a game like this but hey it counts in the record books and in a few years nobody will even remember the circumstance. Jarrett Stidham, QB, Auburn: I haven’t been the highest on Stidham so far this season but boy did he standout against Alabama last week, especially with his legs. One thing I have previously pointed out about Stidham is his efficiency. Stidham’s completion percentage (68.5%) ranks 4th in the FBS; his passing efficiency rating (160.0) is 9th; his yards per attempt (9.1) is 8th. If you only look at his games since Week 3 following the Clemson loss, Stidham’s completion percentage rises to 70.8%, including six games 74% or higher. So, the rate stats are all fantastic but what about the counting stats? They are less eye-popping because of Auburn’s tendency to lean on RB Kerryon Johnson. Stidham has 2,682 yards and just 16 TDs but he has also only thrown 4 INTs. Those only looking at the stats and not watching the film will underestimate Stidham’s athleticism and his rushing ability as I had. The game logs say he only has 153 yards but don’t forget that factors in all of his sacks. If I had to guess, I would say that that Stidham probably has gained about 300 yards rushing (figuring about 10-15 rushing yards per game lost to sacks). Side note: if you don’t typically purchase Phil Steele’s annual preview magazine, this is one big reason why you should because they break down yards gained and lost to get a true sense for a quarterback’s rushing ability. Going back to that Alabama game, Stidham went 21-28 for 237 yards in the passing game which is expected but what surprised me was the 51 rushing yards. 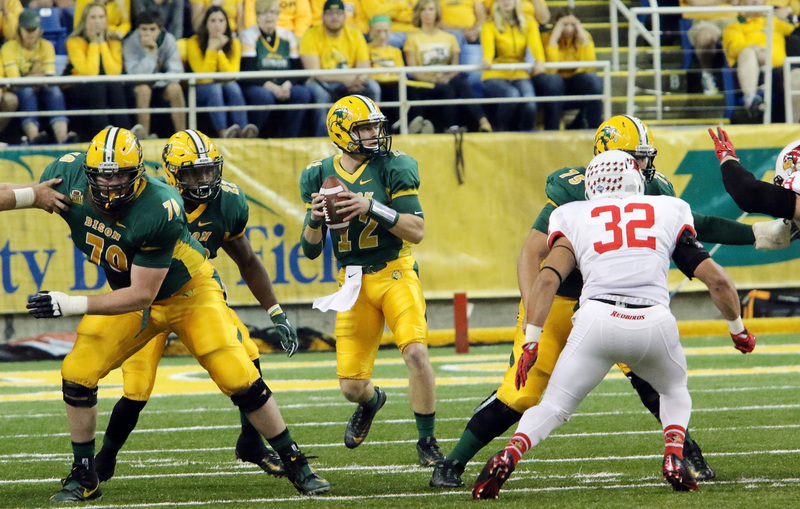 A few plays stood out, one passing and three rushing. On one of the first plays of the game, Stidham double clutched to force the rushing lineman into the air for an attempted pass breakup so he had a throwing lane for the quick screen. The color commentator compared it to a shot fake in basketball which was a perfect analogy. To me, it showed Stidham’s composure under pressure when it would have been understandable for him to be skittish in the first drive of the biggest game of his career. The next play I highlighted was a late third quarter scramble on third and long when Auburn was down 14-13. Stidham took a three step drop out of shotgun so he was nine yards behind the line of scrimmage. He goes through his progressions, evades a rusher, slips out of the pocket, beats CB Tony Brown to the first down and dives head first to ensure he gets enough yardage. It was a turning point play in the game. A few plays later he ran again for 13 yards right up the gut. Those two runs kept the drive alive and led to a touchdown for Kerryon Johnson. The last play where Stidham surprised me was in the 4th quarter with Auburn up 20-14. Stidham fakes the handoff to Johnson on the zone read and keeps the ball himself. He quickly directs his blockers and rolls left. He accelerates as he turns up field and just beats all of the Alabama defenders to the goal line. Ultimately five players were close enough to get a hand on him but he just wanted it more and made the play. I knew Stidham was an efficient and effective passer and was really happy to see this side of his game. Stidham is playing in his first season at Auburn after transferring from Baylor in 2015, so it’s probably more likely that he stays in college for another season rather than declaring for the draft. As I was watching Stidham play against Alabama I saw Alex Smith. They are very similar in size and speed and have a similar game. If he stays in, he will be a preseason target of mine next season. #14 Stanford vs #11 USC, Friday 8:00pm on ESPN: The PAC-12 Championship isn’t worth all that much this season. Neither team has a shot at the playoff and since the Rose Bowl is part of the playoff, a PAC-12 championship doesn’t even get you a bid into the “granddaddy of them all.” If nothing else, this game will be a true showcase game for a few draft prospects, namely Stanford RB Bryce Love (who is within reach of a 2,000 yard season at 1,848) and USC QB Sam Darnold (whose wavering play has some thinking he’ll stay in college another season). 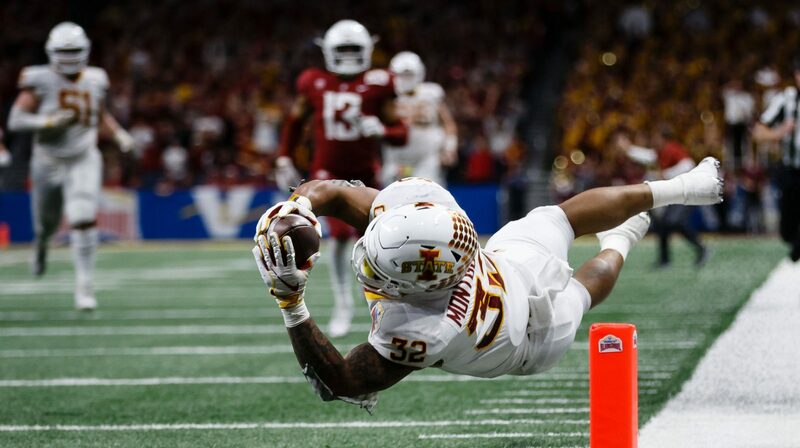 I’ll have my eye on USC WR Deontay Burnett too – he isn’t getting much draft love, mostly because of his size, but I really like him and am significantly higher than most. #10 TCU vs #2 Oklahoma, Saturday 12:30pm on FOX: Oklahoma has much more to play for than TCU so I’ll bet the Sooners come out firing and bury the Frogs. Oklahoma QB Baker Mayfield is incredibly efficient (71.4% completion percentage and just 5 INTs) and is my no-brainer Heisman winner. The good news is that TCU has the conference’s best passing defense (227.5 yards per game); the bad news is that puts them at 73rd in the FBS overall. When these two teams last faced off, TCU’s conference-best defense allowed 333 passing yards and 200 rushing yards, forced zero turnovers and lost by 18. Unless they hold Oklahoma to under 300 total yards they don’t stand a chance at keeping Oklahoma from their playoff berth. #6 Georgia vs #4 Auburn, Saturday 4:00pm on CBS: For me, this will be the best game of the weekend if Auburn RB Kerryon Johnson is able to play. Johnson played through an injured shoulder against Alabama but it sounds like there is a chance he misses the SEC Championship. Jonhson had 33 touches (for 125 total yards and a score) in the Alabama game which is the third time in four weeks that he has had 30+ touches, 125+ total yards and a touchdown. 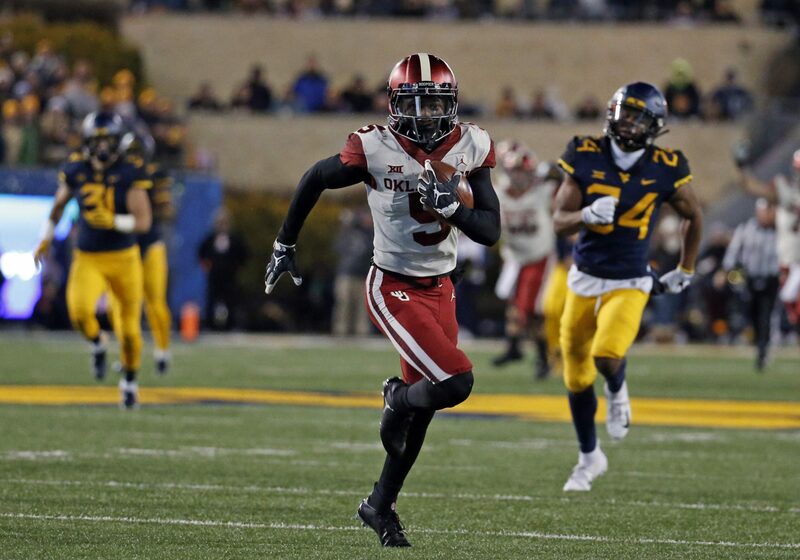 Like TCU/Oklahoma, this game is a rematch from earlier in the year. Auburn shellacked Georgia in that one by a final score of 40-17 (and it wasn’t even that close because of a late garbage time Georgia TD). Georgia has the SEC’s second best defense, led by LB prospects Roquan Smith (100 tackles, 4.5 sacks) and Lorenzo Carter (42-4), so I’ll bet that they’ll keep it closer the second time around. This one is for all the marbles: the winner is onto the playoff without question while the loser is out of contention. #7 Miami vs #1 Clemson, Saturday 8:00pm on ABC: I have been picking against Miami all season long and it finally paid off with their upset against 4-7 Pitt. I just don’t trust QB Malik Rosier because he is so inaccurate (55.2% on the season and 44.1% against Pitt). Sophomore RB Travis Homer has filled in reasonably well for the injured Mark Walton but you’ll be hard pressed to find a tailback that can compensate for a quarterback missing half his passes. Miami’s defense is 14th in points but 42nd in yards allowed which is an odd dichotomy. Clemson has been my #2 squad for awhile and is now my top team. I haven’t been a huge Kelly Bryant fan but he is a solid game manager as a passer and a dynamic rushing threat (639 yards and 10 TDs). True freshman RB Travis Etienne is a burner who carved out a role for himself after a hot start. Etienne has had more carries than incumbent Tavien Feaster in four straight games. His stats have been mediocre but I am interested in seeing WR Deon Cain against Miami’s defense; Cain is a prospect that I have been lower on than the consensus. I have highlighted many of the Clemson defensive stars (i.e. Austin Bryant and Christian Wilkins) but a name that you may not know is LB Dorian O’Daniel. O’Daniel has 80 tackles, 10.5 tackles for loss, 5 sacks, 2 INTs (both of which returned for scores in key Top 15 wins over Louisville and Virginia Tech). If I had to bet meaningful money on any of the championship games, this would be the one. #3 Wisconsin vs #8 Ohio State, Saturday 8:00pm on FOX: As a Michigan and a Rutgers fan, I don’t know who to root for in this one. It’s a shame there are no ties in college football. Since Ohio State isn’t a shoo-in for the playoff with a win, it’s probably best for the conference for Wisconsin to win it. The bright spot on Wisconsin’s offense is freshman RB Jonathan Taylor. 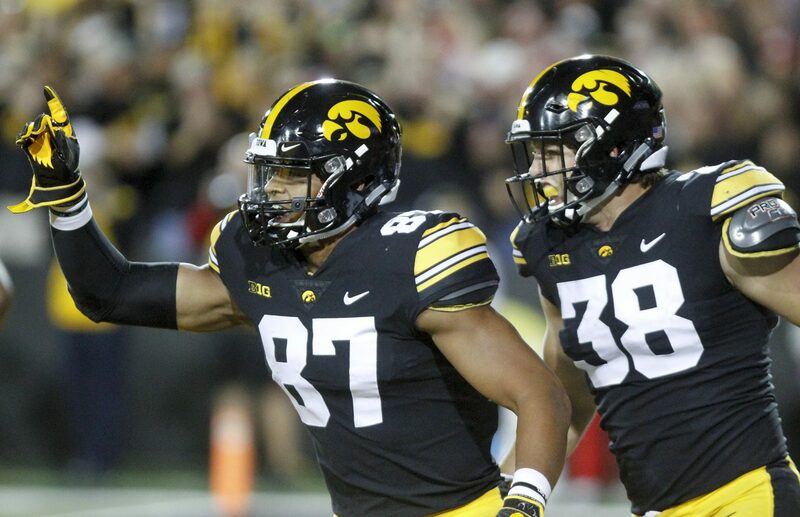 Ohio State has the 13th ranked rush defense in the FBS (112.8 yards per game) and has held opponents to 100 rushing yards or less in seven games this season (including three straight after they were gashed for 243 yards against Iowa). Taylor has 125+ rushing yards in seven of his last eight games and I expect him to continue that streak. Wisconsin’s rush defense is actually better than Ohio State’s (1st in the FBS at 80.5 yards per game) so I doubt that either JK Dobbins or Mike Weber will be a major factor. Much of this game will come down to whether JT Barrett can return from a knee injury sustained against Michigan. Ironically, I think that the Buckeyes might be better off with Dwayne Haskins under center because he’s more of a pass-oriented quarterback. Wisconsin’s pass defense is ranked 2nd so while it may be weaker it’s hardly a weakness. Regardless of who is under center, I think Ohio State will struggle to move the ball like they did early against Michigan, and the Badgers will win a close one.